Summary: A new study reveals viruses can disable the production of Foxj1, causing ependymal cells to lose their structure, sparking hydrocephalus. A new study reveals viruses can disable the production of Foxj1, causing ependymal cells to lose their structure, sparking hydrocephalus. 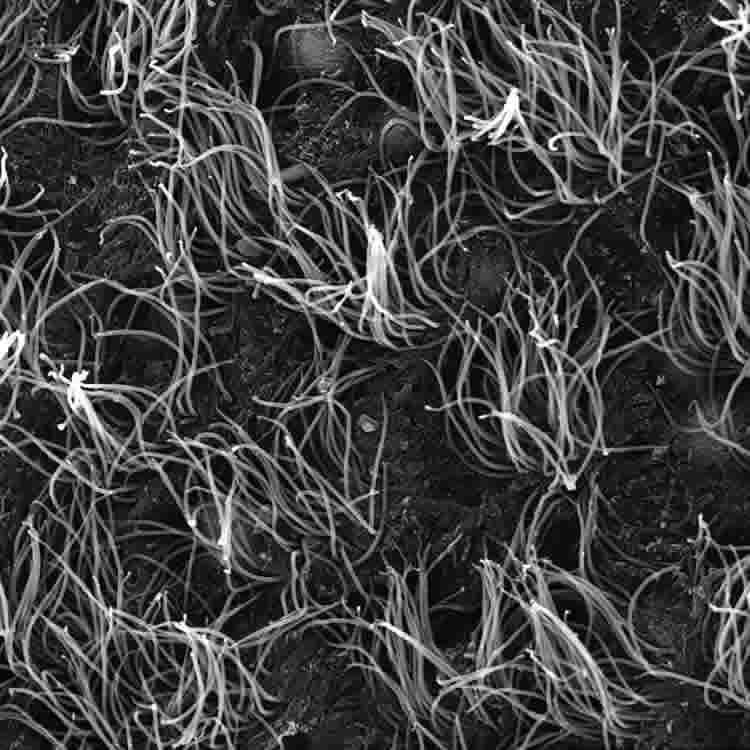 Cells shaped like sea anemones line the cavities of the brain, rapidly beating their cilia to keep cerebrospinal fluid circulating. These cells, called ependymal cells, provide homes to neural stem cells and can play a key role in preventing hydrocephalus, the potentially deadly build-up of cerebrospinal fluid in the brain. The researchers discovered that mature ependymal cells from mice require a continuous production of a transcription factor called Foxj1 to maintain their shape and function. Without Foxj1, the cells lose their waving hair-like structures and rapidly revert to an earlier stage of development. Viruses known to infect the brain have found a way to shut down the production of Foxj1 and disable the cells, the researchers report April 25 in Nature Communications. Currently the only treatment for hydrocephalus is inserting a shunt to drain excess cerebrospinal fluid, an approach which only works in roughly half of patients and can cause serious complications. This study indicates that drugs that preserve the production of Foxj1 in ependymal cells may provide an alternative treatment. Kuo and postdoctoral fellow Khadar Abdi, Ph.D., initially set out to grow ependymal cells in hopes of studying their role in nurturing neural stem cells, Kuo said. They found that infusing brain cell progenitors with a drug known to pump up the production of Foxj1 triggered more cells to grow into ependymal cells. Surprisingly, when they switched off the Foxj1 gene in mature ependymal cells in mice, the cells swiftly transformed back into their early undifferentiated state. In another unexpected experimental result, Abdi observed that Foxj1 is fragile: the protein can degrade in as little as two hours, meaning that cells must continuously manufacture new Foxj1 to preserve their cilia and shape. “They are constantly running to stand still,” Kuo said. The team discovered that ependymal cells use an enzyme called IKK2 to spur the production of Foxj1. A number of viruses, including the herpes simplex virus, have evolved machinery to block IKK2 and, in the process, halt the continuous production of Foxj1. Wellington Cardoso, M.D., professor of medicine and director of the Columbia Center for Human Development at the Columbia University Medical Center, praises the study for charting how multiciliated ependymal cells maintain their identity and function in the brain, thus preventing brain defects such as hydrocephalus. Brain cells shaped like sea anemones rapidly beat their arms to keep cerebrospinal fluid circulating. NeuroscienceNews.com image is credited to Chay Kuo, Duke University. “I would be curious to see if this same mechanism applies for other multiciliated cells of the body, like those in the airways of the respiratory tract,” Cardoso said. For his part, Kuo wants to know why an important cell in the brain would have such an unexpected Achilles’ heel. Funding: This research was supported by the National Institutes of Health (R01NS078192, R01NS0960960 and R01MH105416), the George Brumley Jr. Endowment, and the March of Dimes. Image Source: NeuroscienceNews.com image is credited to Chay Kuo, Duke University. Original Research: Open access research for “Uncovering inherent cellular plasticity of multiciliated ependyma leading to ventricular wall transformation and hydrocephalus” by Khadar Abdi, Chun-Hsiang Lai, Patricia Paez-Gonzalez, Mark Lay, Joon Pyun & Chay T. Kuo in Nature Communications. Published April 25 2018. Duke University “Brain Cell’s Achilles’ Heel May Prompt Hydrocephalus.” NeuroscienceNews. NeuroscienceNews, 25 April 2018. Duke University “Brain Cell’s Achilles’ Heel May Prompt Hydrocephalus.” http://neurosciencenews.com/hydrocephalus-foxj1-8882/ (accessed April 25, 2018). Specialized, differentiated cells often perform unique tasks that require them to maintain a stable phenotype. Multiciliated ependymal cells (ECs) are unique glial cells lining the brain ventricles, important for cerebral spinal fluid circulation. While functional ECs are needed to prevent hydrocephalus, they have also been reported to generate new neurons: whether ECs represent a stable cellular population remains unclear. Via a chemical screen we found that mature ECs are inherently plastic, with their multiciliated state needing constant maintenance by the Foxj1 transcription factor, which paradoxically is rapidly turned over by the ubiquitin-proteasome system leading to cellular de-differentiation. Mechanistic analyses revealed a novel NF-κB-independent IKK2 activity stabilizing Foxj1 in mature ECs, and we found that known IKK2 inhibitors including viruses and growth factors robustly induced Foxj1 degradation, EC de-differentiation, and hydrocephalus. Although mature ECs upon de-differentiation can divide and regenerate multiciliated ECs, we did not detect evidence supporting EC’s neurogenic potential. The truth will emerge sooner or later. My brother in law had undiagnosed Lyme, treated short term Fast decline including shuffle walk, got serious shingles on his face, teeth pain. very rapid deterioration after that including endrocephalus surgery with tube placement. Nothing worked, continued to decline with lots of mental stuff and top of physical stuff. Had thyroid removed. His private parts were huge. Nobody cared not investigated that bacteria was the cause, Yes it activates viruses too. Actually 2 viruses were found to be bacteria in 1989. The relationship between these 2 and western blot 31 and 34 is there. These 2 numbers are not considered valid under CDC guideline (removed) as the those are staphylococcus aureus bacteria (#31 is opsA) strain 300. yes quite virulent, epidermis and biofilm formation. Ferments glucose for spreading. #34 is a combination of ospA and OspB) and very fungal. 31 is fungal is less, #34 takes longer for infection and deeper infection. In my opinion shingles is a serious case of impetigo. How do I know I also have a systemic infection with staph aureus, serratia marcescens and enterococcus faecalis. I got married to his brother who always got staph infectious and still now call them poison ivy. All my kids have symptoms. Son even born with impetigo. Husband with also brain, thyroid and prostate surgery. He tested super high on Mycoplasma iGg but of course is not considered any infection. I tested pos for chlamydophila C pneumonia . Difference I most likely got a super infection as the infection given to me prior to marriage combined with a previous infection of osteomyelitis. Yes it is a rare thing to have. This BCG vaccine (given to me 2x) through polio and TB vaccine has made me super ill. I still do not qualify for help because the S protein from the blood disorder that I have rendered me mentally ill for decades. I know what caused what but since I was nuts I am still considered nuts. I only did this according to the father of medicine ” if you are not your own dr you are a fool” sadly the sage continues because doctors are trained to use tests only, symptoms do not matter. As Albert Einstein identified ” I hate to see the day that test replace human interactions, when that day comes we will have a bunch of idiots”. Well that day occurred for sure decades ago. In my less than PHD education level the burning of fossil fuels (including fracking) is the cause of all this staphylococcus areus taking over the world. It is the smalles but most deadly living organism but “IT CAN NOT EXIST”. Therefore Lyme can not exist, therefore all insects can not be infected either. It is all in your head. We will continue to use deadly immunizations (that contain bacteria) including the Lyme vaccine (which contains #31 and #34) to infect all so that medicine has a supply of ill persons that return every 3 months. No I never got sick from a tick or anything like that. Just fell in love with a GI in Holland. To finalize this sister in law with amputation of toes due to staph aureus infection decades ago too, now has Parkinson. Brother who died after endrocephalus was in so much pain, even his teeth had been eaten away. His beets were beet red a few weeks prior to death, needing to be restrained to stop his scratching. We have such a great health Care!